All right, heaven help me, I’m going in again! 2015 was a success, so lets hope I can build on that! I doubt I’ll be reading 260 books again this year, but 40 of whatever I do read are going to be targeted towards these challenges. Same challenge as last year, but down a level. I might level up if I seem to be on a roll, but I wanted to make it an even number of books. Because that’s how my brain goes. The challenge I used last year closed, so I found this one instead. I like that I’m not locked into titles, but can choose anything from my TBR list as the mood suits. I prefer freedom and really hate being told what to do, even by myself, ha. I also liked that it wasn’t limited to books I own, since I do so much of my reading plans from library books. Subgoal: half will be ones I own, half will be titles from my GR shelf. Panels Read Harder comics challenge : I think this one will be the biggest challenge, as it doesn’t lend itself well to things I have an interest in. But then again, I did 10 of these last year, so I am sure that I will find ways to finish it this year! Any recommendations for any of these? I know what I tend towards, and it’d be great to try new things again this year. I am not known for enjoying books that emotionally break you. I tend towards genres – romance, science fiction, etc. 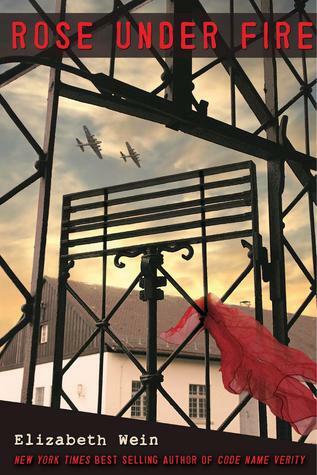 But I have always loved historical fiction deeply, and World War II in particular. Last summer, I read Code Name Verity. I heard amazing reviews about it for months, but always coupled with, “It broke me.” I do not like books that break me. But everyone kept reading it and everyone kept raving and then Susann said, “One of the characters is half Peter Wimsey/half any Ellen Emerson White heroine!” and, well. How could I not read that? It totally broke me. In the sitting there on the floor, can’t stop reading, omg, I have to reread it again RIGHT NOW even though my heart is broken way. The first part was astounding on its own, but then the second? It illuminated the first part in ways I couldn’t have dreamed. I was constantly flipping back and forth, seeing it all come together. I put some things together on my own but there was always more. So, basically: World War II, England and France, English and Scottish female war pilots/workers, intrigue, enemy territory, deep friendship . The story of one girl captured by the Nazis for war information and the story of love and friendship that she told them, surrounded by horror and hate. It sort of defies description, especially since I don’t want to spoil anything. It’s beautiful, even in its darkness, because the light shines the more brightly for it. And then, in May, I learned that the companion book, Rose Under Fire, was coming out this fall, but it was available as an advanced reading copy for librarians and bloggers on NetGalley. I immediately logged in and requested access. Huge thanks to NetGalley and Disney Hyperion for the chance to read and review. Here we have a new protagonist, 18 year old American Rose, and a few familiar faces from Verity are in the mix as well. I went into this knowing nothing except that it was a companion – I didn’t even get a description (letting me know that it was a concentration camp story) until I was about 50 pages in. It started slow. I had no idea what to expect, which probably made it go more slowly. When it started to pick up, things started happening out of order and I wondered if this was really the best way to tell the story. Then it turned into a flashback and I was pretty lost, wondering, “She lost X? So what? What does that mean?” I kept going and very quickly my response turned to, “Oh my GOD. She lost X. SHE LOST X. How did that happen? Oh my God.” And then I stayed up until 2:30 in the morning, utterly absorbed and heartbroken. Like Verity, this is sophisticated narration with complex emotions on a basically straightforward story. It stuck with me for days after finishing it – the stress and horror of what she saw at Ravensbruck, but also the sadness and hope at the end. There’s no real neat way to tie up a story like this, but the ending felt true. And I only let out a tiny wail of despair that it ended – I wanted so much more. The story was complete, but I just loved these characters too much to say goodbye. It’s beautiful, like Verity, in its exploration of friendship, love and devotion even in times and places of horror. You don’t need to read Verity first, they stand alone. It might be hard to get teens to trust the story/storytelling if they aren’t familiar with and blown away by Verity, but it’s worth the push through to watch it all come together. Both titles are highly recommended. Outfit posts are coming! I’ve been reading up a storm this week, which means less time on the computer for blogging. I’ve finally managed to update my current jam, hurrah. I’ve also added links to my sidebar – I totally dig Rue La La and Zulily, and think you guys might, too. I also added a link to my GoodReads account. As my blog title says, I am a librarian. It’s actually a pretty big part of who I am – sometimes that informs my clothing choices (no short or a-line skirts on storytime days! ), hee – but I’ve been thinking that it might be nice to add a little bit of my other passion, books, here as well. I’ve recently been able to start getting advanced copies of new titles, before they’re available for sale, and I’d love to share some books I recommend (or, you know, don’t), too. Fashion is clearly the driving force behind this blog and always will be, but let’s test it out and see if these two big interests of mine can co-exist. A little experiment.